Jathedar of the Akal Takht to address Yogi Bhajan's Khalsa Council: Sikhs demand reprimand of 3HO! 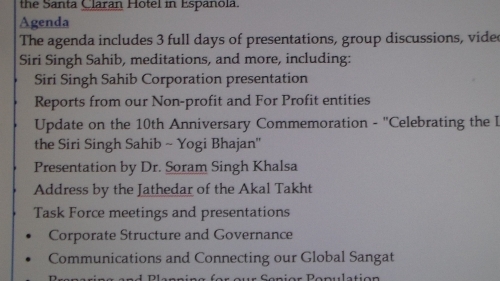 Jathedar of the Akal Takht will address Yogi Bhajan's "Khalsa Council" on October 1st. Sikhs demand the Jathedar strongly condemn violations of the Sikh Reht Maryada by Yogi Bhajan's followers in the Jathedar's address or he should just cancel his speaking engagement with Yogi Bhajan's "Khalsa Council" in protest of Bhajanists' continued flagrant disregard for the Sikh code of conduct. Sikhs should write the Jathedar of the Akal Takht to demand he take a stand & reprimand Yogi Bhajan's followers in his address on October 1st before Yogi Bhajan's Khalsa Council! Guruka Singh of SikhNet ~ "You can go to occultists, it's not a problem. It's entertainment." 3HO spiritual name request: Just another $$$ making gimmick for Yogi Bhajan's kundalini yoga cult?" Guruka Singh & these 3HOers are nothing more than greedy hypocrites! The practice of astrology & numerology is in direct violation of the Sikh Reht Maryada yet 3HO, a SikhNet partner, is trying to fool people into believing that Yogi Bhajan had some ancient secret method of numerology for seeing your destiny in order to sell you the proper spiritual name? This numerology of Yogi Bhajan's is complete nonsense and against Sikh teachings but yet 3HO uses it to make money off innocent yoga students who want a "spiritual name".